Football season is my favorite time of year. I love the game. I love my fantasy team. (Not really, but that’s what happens when you auto-draft. Oh well.) 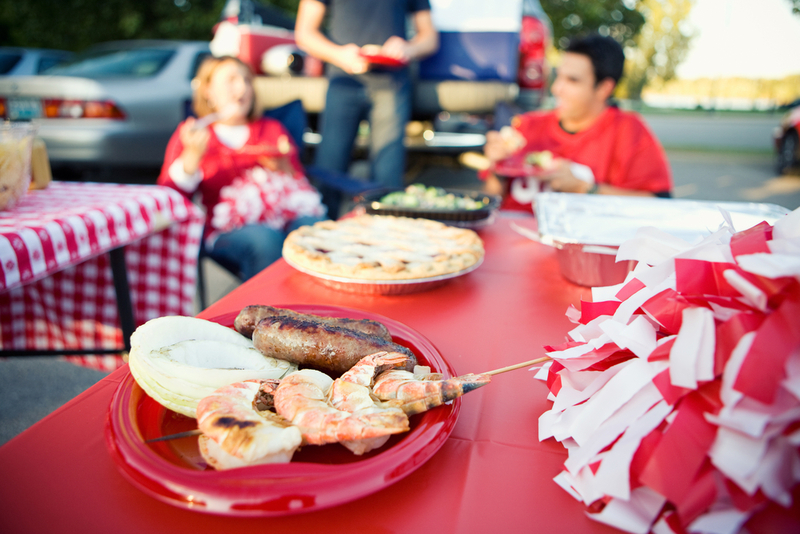 And I love all the tailgating recipes, ideas and fun. Hometown tailgating is a blast, but visiting the other stadiums in the league can be a great experience as well. Especially if you fancy yourself a bit of a “tailgating foodie” and understand that it’s not all about hot dogs and beer anymore. Arizona Cardinals – green chile pork or green chile stew, or pretty much anything you can make with green chiles. including the bright green relish and dill pickle spear. Cincinnati Bengals – chili flavored with cinnamon and chocolate and served any way you want it – have chili, chili two-way (over spaghetti), chili three-way (over spaghetti and topped with cheese), chili four-way … you get the idea. Cleveland Browns – beer can chicken … so it’s chicken, flavored with beer. Yup, that works. Dallas Cowboys – jalapeños … some may argue that chicken fried steak is the food you’ll see most at a Cowboys tailgate, but in actuality, it’s jalapenos, stuffed, diced, breaded, fried, grilled – you name it. Houston Texans – brisket, because there is nothing better on game day than Texas brisket cooked low and slow. Kansas City Chiefs – BBQ, BBQ and more BBQ, slathered in sauce and served on pieces of white bread with pickles on the side. Naturally. Minnesota Vikings – ground beef stuffed with American cheese and then grilled. Also known as a Jucy Lucy, a big thank you goes out to the former owner of Matt’s Bar for introducing this little slice of heaven to the world. New England Patriots – lobster or clam chowder … are you surprised? New Orleans Saints – gumbo, jambalaya, po’ boys – if it’s made with seafood fresh from the Gulf and served Cajun style, it’s probably here. Philadelphia Eagles – cheesesteaks, some wit, some wit-out, some whiz wit. It’s really up to you, and if you understand that vernacular, you’re already a pro. San Diego Chargers – fish tacos … in Southern California? Now, who came up with that wild and crazy idea?